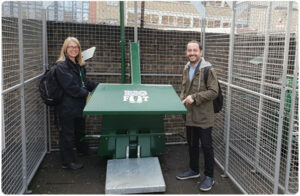 The London Borough of Islington has installed the PEL UK Rentals Ltd PEL1100SBC solar powered bin compactor in the Chapel Lane market to minimise the impact of the incoming Ultra Low Emission Zone (ULEZ) being introduced by Transport for London on 8th April 2019. Chapel Market at the Angel in Islington, London is a daily street market with 224 stalls where the vendors sell fruit, vegetables and fish, along with household goods and cheap clothes. The market is open six days per week and the London Borough of Islington has responsibility for waste collection along Chapel Lane where the market is held. Currently, Transport for London (TfL) imposes a charge any older vehicles driving in central London in addition to the existing Congestion Charge. The additional charge or T Charge aims to help improve air quality in London, in particular with regard to nitrogen dioxide (NO2) and particulate matter, both of which have an adverse effect on human health. From Monday 8th April, the T-Charge (officially known as the Emissions Surcharge) will be replaced by the Ultra Low Emission Zone (ULEZ) which will mean vehicles using central London will have to meet new, tighter emissions standards from that date or pay the increased charge. Waste management vehicles operating within the central London area including those belonging to the London Borough of Islington are liable for the charge unless those vehicles are compliant with the new stringent regulations. The London Borough of Islington approached PEL UK Rentals Ltd for assistance on reducing the number of collections required to manage their fleet of 1100 Litre wheelie bins in the Chapel Market area. The bins are used by traders for disposing of the recycling and general wastes generated by the market and have to be collected a minimum of three times daily. Collection trucks cause congestion, generate emissions and because of the impending ULEZ charge collection costs for the borough will rise significantly if the existing practices are continued after Monday 8th April. PEL UK Rentals Ltd recommended the Solar Powered PEL1100SBC solar powered bin compactor as a solution to the council. Two (2) PEL1100SBC solar powered bin compactors were installed in the Chanel Lane waste yard enclosed in special safety cages in order to limit public access. The bin compactors will compact the waste volumes of up to three bins into one bin and in doing so, reduce the number of bins required for storing waste generated by the market. Compacting the bins will also reduce the required collection visits from three times per day to a single collection daily; cut waste collections traffic and associated emissions, improve street hygiene and minimise impact of the ULEZ charge on the Borough waste collection budget. This exciting green initiative by the London Borough of Islington will have a multitude of positive benefits for the Chapel Lane and wider Islington environment. PEL UK Rentals Ltd looks forward to working with the council on this solar powered bin compactor project and other initiatives to improve the borough going into the future. PEL UK Rentals Ltd based in Highgate, London N6 5AT is a leading supplier of bottle crushers, bin compactors, vertical balers and IoT litter bins. The SolarStreetBin™ is the latest addition to the product range and adds to PEL’s recognition as leading innovator in the waste reduction market.